Find your peace and yourself in the country house of Acquaviva. Property 1: Find your peace and yourself in the country house of Acquaviva. Art, nature and peace upon the mountain of St. Francis. Property 3: Art, nature and peace upon the mountain of St. Francis. We had an unforgettable time at Casa Rosa! Not only the apartments are cosy, beautiful and quiet. But the location also deserves 5 stars: surrounded by the Umbrian forest and secret blue waterfalls, wild animals, spectacular views. It is also only a short drive from Assisi and many other lovely Medieval hilltowns that are rich in history and art! We will definitely be back. Thank you so much for your hospitality! 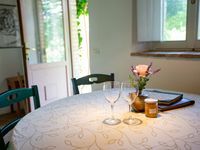 My husband and I arrived at Pianciano to stay in Il Cipresso, a cozy, elegant former stable nestled comfortably into the hill with a spectacular view of the valley. We were there to celebrate his 60th Birthday. Upon our arrival we went to sit by the beautiful pool when all of a sudden we heard voices and looked up: our older daughter and her husband, and our younger daughter and her boyfriend, walked down the hill to the pool. My husband was stunned! I planned this wonderful surprise with Claudia&rsquo;s help, and the six of us spent a memorable week at Pianciano touring nearby Bevagna, Montefalco, Spoleto and Assisi, cooking fabulous dinners with vegetables from the garden and eggs plucked from the property&rsquo;s chickens. We swam, hiked, went horseback riding and drank wine watching the sun set from our backyard. To celebrate Father&rsquo;s Day Claudia arranged for us to make our own pizzas with the help of her Roman chef friend Fulvia in the property&rsquo;s stone pizza oven. She also took us on a personal tour of Francesco&rsquo;s noble ancestral home Il Paradiso, just down the valley from Il Cipresso. We felt more like family than visiting guests. Being together and sharing the beauty of Umbria at Pianciano was unforgettable.